A native species with fruits so bitter that only the birds will eat them - but they'll love them! 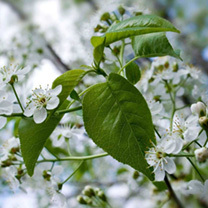 Wild Cherry can be trimmed to the same height as other species in a mixed native hedge or allowed to grow as a hedgerow tree. It has beautiful highly fragrant white blossom in May, pretty mid sized green leaves and wild cherries in autumn which will be much appreciated by wildlife. Flowers early March-October producing white flowers. Available in packs of 25 or 50 bare roots and grows 20-40cm per year.